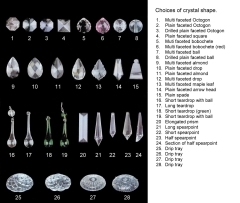 A plate showing various crystal shapes commonly used in our chandeliers. The 700 + crystal pieces, 18 drip trays, glass and gold lamp holder sleeves that dress the 18 light chandelier S2. Crystal Pendant. 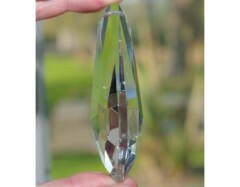 Plain Faceted Crystal Spear. 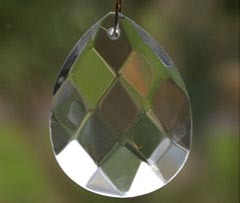 Not a good photograph, but it clearly shows the shape of a Maple Leaf crystal drop. 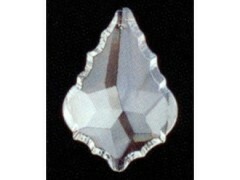 Side view of a multi faceted crystal almond drop, clearly showing the faceting and overall thickness. This section provides examples of the different crystal drops available with our chandeliers. Each piece comes in an assortment of sizes, which are selected to best suit the size and style of your chandelier. 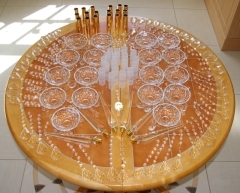 Due to the staggering variety of crystal used over the years, in size, crystal quality, lead content, pattern and colour, it is not possible for us to guarantee to match the crystal on any given chandelier unless it is one that we originally supplied. If you have an old chandelier which you are refurbishing, we will try to match the crystal on it, but you will need to send us a sample. If we can't match it, the likelihood is that nobody else can either, and you may simply find it easier and cheaper to replace all the crystal for new, or even buy a replacement chandelier. All we can promise to do is help where we can. The standard crystal on most of our chandelier has a lead content of around 10%. This is much sharper, clearer and will give much better light diffraction and splitting than plain glass. We hold a large range of 10% crystal pieces in stock and we are more than happy to offer samples so you can get a better idea of the quality of the crystal. Full lead crystal with a 30% lead content, Asfour crystal is world renowned for the excellent quality of crystal and workmanship. It offers a much higher diffraction and clarity then the standard 10% crystal and being computerized precision cut, it has razor sharp facets and lots of colours when shone in the light. All of our crystal chandeliers can be upgraded to Asfour crystal or you can specify to have your bespoke chandelier with Asfour. The standard crystal used Edoardo Casa in his range of crystal chandeliers, Swarovski Spectra is the only line of lead-free crystals produced by Swarovski. They are the most optically pure glass made and having the same high quality cut and surface polishing as all Swarovski crystals they retain the vibrant colour spectrum, sparkle and brilliance which Swarovski crystal is famous for. They are also much lighter in weight than Straa crystals as they have a much lower lead content. Known as the most exquisite and highest quality lead crystal available in the world, Strass crystal has a 32% lead content. It is precision cut and polished to create all of the famous Swarovski trademarks as mentioned above for the Spectra crystal. All of our crystal chandeliers by Edoardo Casa can be upgraded to the Swarovski Spectra, please contact us for more details.